Buetts Fence has installed many ornamental iron fences in Pocatello and surrounding areas. Ornamental Iron fencing or Wrought Iron fencing, offers a classic style with excellent durability and security. Ornamental iron provides security and a professional look for your commercial or residential property. 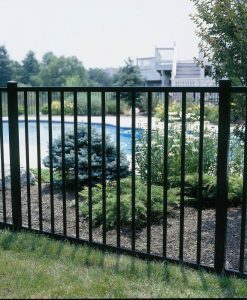 Ornamental Iron comes in many different styles and sizes. We offer 2 styles varying in heights from 4′ to 6′. If you need additional styles or have commercial needs we can accommodate you depending on your needs for design and security. Buetts Fence Products supplies multiple ornamental and decorative metal fences & gates for pool fencing, backyard fencing and dog fencing. Buetts welded and bolt on ornamental steel fences are the most popular and widely installed by contractors in the nation. Our innovative fence designs and maintenance free coatings satisfy consumers need for high quality, affordable iron fence. 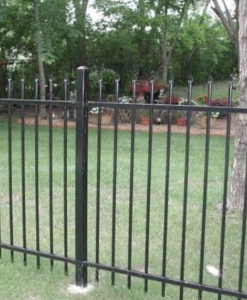 Balancing Buetts Fence ornamental steel fences are two varieties of residential Iron fencing. Buetts Fence industrial fencing has helped sculpt the architectural arena by offering products of superior strength and durability. These industrial ornamental fences have challenged the status quo by setting standards in the fence industry for more durable coatings that yield a longer product life. Buetts Fence progressive profile designs have contributed to raising the bar for strength of product, and are still recognized as the strongest fence systems in the industry.